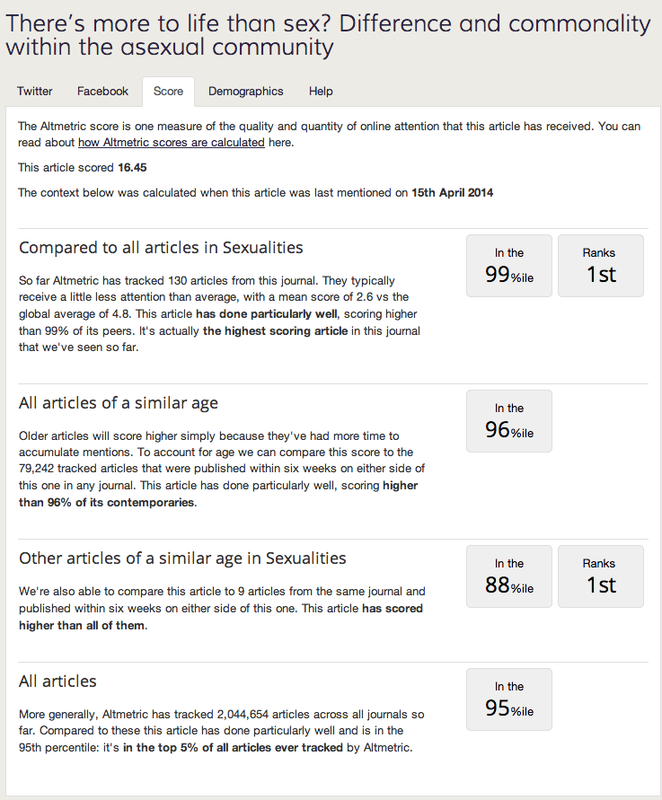 I just received an update from Altmetric about one of the publications I’m tracking. I think it’s a good paper but its relative visibility online obviously stems from my own tendency to blog and tweet about it. Early adopters will inevitably gain more rewards in this respect but I’m nonetheless convinced that everyone should blog and tweet about their publications if they want to maximise the number of people who read them. Another idea that just occurred to me is the possible value of thematic aggregators as a way of overcoming the inequality of reach on Twitter (i.e. the more followers you have the more visible your papers will be) – so an account that aggregates publications for a particular topic. I’ll have a think about this and I’ll possibly setup a @sociologicaltheory or @sexualitystudies account in the next few days. The first is from a talk about Open Access at the Institute of Art and Design at Birmingham City University. The second is a talk about social media I did for the Text and Academic Authors Association. The former has been viewed over 2000 times and the latter has been viewed over 1500 times. These are the most popular but there are slides on my slideshare account from a range of other talks and most seem to have been viewed 300+ times. These are not slides designed for online dissemination. These are not slides I’ve made any effort to promote. Yet people do look at them. If you search for the most popular slides of all time on slideshare, it soon becomes obvious how powerful slideshare can be for dissemination. There are countless pages of slides that have been viewed hundreds of thousands (in some cases millions) of times. Using Prezi as an online only tool for dissemination has come naturally to me. Partly because I struggle to present with Prezi for a variety of reasons. My first Prezi, how to create a successful online presence, has now been viewed almost 4500+ times. I’ve occasionally tweeted the link but otherwise made no effort to promote it. Some of the others have been viewed thousands of times and I’m surprised to find that seemingly obscure conference presentations I’ve made no effort to promote have been viewed hundreds of times. My point is not about the stats per se but rather that these metrics are fallible indicators of the visibility facilitated by Slideshare and Prezi. It doesn’t take much of a conceptual leap to get into the habit of archiving presentations by uploading slides after the fact. However the audience on Slideshare and Prezi is potentially much larger than that which you gave the talk or lecture to. Recognising this fact shouldn’t lead us to counterpose ‘offline’ and ‘online’ in a dualistic way but it does suggest that perhaps we should consider the latter as something other than a second-thought. What does this mean in practice? I’m not really sure and that will be a topic for another post. It’s a plan for a short book (Zero or Pivot style) which I’ve intended to write for over a couple of years. It is a ‘plan’ in a very different sense to anything I’d written in text alone. It will require a lot of translation to turn it into a book proposal. But the substance of the planned book is much clearer in my mind than it would otherwise be. I’m also reasonably confident that others will find the book interesting. Perhaps the downside to this is that the Prezi has left me so clear about the book’s argument that the ensuing immediacy with which I confront the hard work of actually substantiating it has proved a little demotivating! Though this is far from the only reason I’ve yet to start proper work on this.